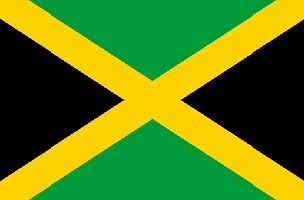 Jamaica is part of the Greater Antilles and it covers 10.991 km2. It is the home of almost three million citizens of which 92% are ethnic Africans. 69% are Christians and only 1% Rastafarian, although way more look that way. It was first colonised by the Spanish in 1494, then the British moved in in 1655 and it gained its independence in 1962. The climate is tropical, and with the Blue Mountains, that create a rich nature, although sugar plantations have taken their part of the former dominant forests. 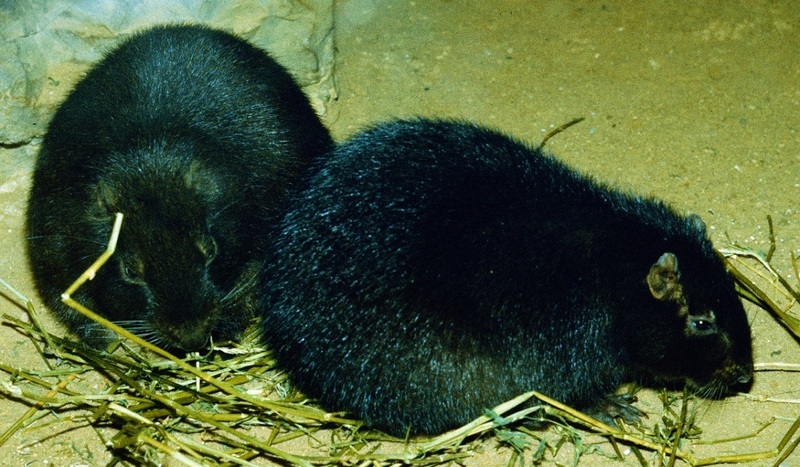 One of the more interesting animals is the Jamaican hutia; Geocapromys brownii: a rabbit sized Guinea pig. Here are around 50 species of reptilians, and the birdlife even more impressive. Two hours later, I'm on a flight to Kingston, which I reach after additional two hours. I find my car. It turns out US$ 300 is not enough; they want 837. Insurance and local taxes add up. I head out thought the outskirts of Kingston, but pretty soon, I reach the green mountains. After the flat Bahamas, it look real great. I stock some breakfast and water in a supermarket, and cash in an ATM, just to be sure. Within long, the road turns real narrow and mountain-like. Here are still a few huts along the road, but most look like unspoiled nature. I drive slowly and try to enjoy it, without missing the road. As I head further into the green mountains - which actually are named The Blue Mountains - the road looses the sealing, and it get real tough. I am glad I did sign-up for the full insurance! If I can't have a Land Rover, a rented car with full insurance will do. I pick-up a pair of locals, and without them, I would not have made it over some of the bad and real steep parts: They are in for a push-push safari. At five, I reach Jah B's Guesthouse. Their picture on Booking.com look real low-key, but it is a real nice place, which luckily offers dinner. Unfortunately, they do not have hot showers, despite the high elevation and low temperature. The only guests are two other Danes. I make a short stroll in the late afternoon, and return to a traditional Rasta vegetarian dinner: No meat, no salt, and it tastes great. The others head the beds early, as they will start a hike at two in the night, to see the sunset from the top. It is a bit cold, and I find my socks and fleece jacket. The Blue Mountains, part 1. 4. It is a bit nippy during the night, but I have three blankets, and feel fine. I get a cup of tea along with my own breakfast, and then set out, into the Blue Mountains. I follow the path leading to the top, through steep and wild mountainsides, dotted with small coffee plantations. I find some Oxalis, Bromeliads and Begonias along with a strange thing. It might be the flower of a parasitic plant: Balanophoraceae: Scybalium jamaicense. I find several other interesting plants, although I am not sure all are indigenous. At least some of them are Madagascan for sure. The narrow gravel road winds its way through the steep hills, and reveal one view after the other. I reach Jacob's Ladder, a steep part of the trail, and here, I meet the other Danes. I know they will be served breakfast, when they returns, and I join them back. It the afternoon, I head out towards Penlyne Castle. The vegetation does not change much, but the views are great. Penlyne Castle is a gathering of 8-10 former colourful sheets along the real bad road. They are made up by wood and tin-plates. I meet an old fart with a donkey and pass a few goats. Besides from the coffee bushes, here are some bananas. I head back when the trail kind of disappears, and try the bigger road back towards Hagley Gab. Some dark clouds make me turn around, and in the middle of the afternoon, I'm out of ideas of what to entertain myself with. I don' dear driving down the mountain again, before I have to: I still need the car for eleven more days. I try to plan the route to next group of sights: Either through the mountains or along the eastern coast. The clouds closes in on the mountains, and it get chill. Then the rain starts, and I figure the tour down the mountains will be even more difficult in the morning. Blue Mountains, part 2. 5. It turns out I was upgraded by Jah B, and instead of US$20 I have to pay US$50 a night. On the other hand, the three great meals only coasted me US40. The mist clears up, and I head down the mountains. The car growls a lot: The ABS is active on long stretches of the steep decent. I have found a route on Google Maps that my GPS do not know: It lack an essential little connecting road, and it suggests a 50 kilometre detour. That is a lot in these mountains! I hope for the best, and the road is actually there. I pass Hagley Gab again, and see their post house. The road is fare from smooth, and in two places, I have to cross a river within it. In the lower parts of the mountains, bromeliads and Rhipsalis cacti are quite numerous in the trees. After two hours and 40 kilometres, I finally reach the lowlands. Here are a few cattle farms and sugar cane fields. The eastern coastal road is significantly smaller than I had thought. In some places, the sealing lack, in others, it is a one lane road only. But the views are great, both up the green hills and to the coast. Here are only a few settlements, and all real low-key. I do several stops at the especially nice places. Some crystal clear rivers meet the sea, and some coves are just perfect. I pass Reach Fall, but will return another day. Around two, I reach San San and find my home for the next three days. It is a lovely old house, right next to the coast. I start with a much needed hot shower, then the local beach, where only tow fishermen are found. A sheet on the other side of the road offers tea and patties, and I get a great patty and tea in a half coconut. Not really handy, as it can't stand by itself. A bit further down the road is the famous Frenchman's Cove found. The charge US$10, just to walk to the beach, and I expect some fantastic sights. Well, first I chooses a blind road, leading into the tall and dense forest. It is real dark, but magnificent. Then I head down towards the cove, and the path follow a crystal clear river. The cove is, on the other hand, a disappointment. A few fat Americans are sitting in the shadow, shouting to each other, and that is about that. Of cause, the perfect beach in-between the dark brown rocks look nice - all 50 metres. I return way faster than the entrance fee suggested. I walk back to the guesthouse and re-organise. In the late afternoon, I head further on to the cosy Port Antonio, an old town that still have most of its charm. Just before the town, I pass a huge private home; real strange to see among all the humble sheets I been passing. It belong to the riches man on Jamaica, whom is said to actually owe the Blue Lagoon, and being too cheap to install a single toilet for the people working there. I park in the middle of town, and find the market. Then I do the back-alleys and the coastal road. People are real friendly and curious, and all with a vide smile on their faces. As the sun sets, I find a supermarket and stock some supper for the next days. Back to cook some, and do the usual work. I have bought some tea, and now I know why the traditional Rastas don't use salt: Their tap water contains plenty! For a first, it is steaming hot in the evening, and I would even consider turning the air-con on - had there been one. Where I streamed WCR without any problems in The Blue Mountains, I fail to get the most simple pages to load here. Blue Mountains, Eastern Coast, San San, Frenchman's Cove. and another with Port Antonio. 6. I head 30 kilometres back towards the east, to reach Reach Falls. I stop time and time again, when the road meet the coast, or the green inland hills look especially tempting. Here are only a few settlements but a lot of nature. In some places, the dark brown ancient coral rocks raises high above the sea, in other places, perfect sandy coves meet the green interior. A single settlement have a few surprisingly hairy pigs roaming around. I use the see this fluffy pigs in the high mountains only. I reach Reach Falls, and they say I should have a guide to enter the line of pools and falls, but I rather not. I don't feel like being rushed from one pool to the next, by a guy who constantly babbles in a rather strange languish. I succeed to bounce the guides and the avoid the guard, and after I have seen the lower pond, I find a trail, following the stream upwards. Well, kind of; a lot of time, I hop from rock to rock. Here are absolutely fantastic! The turquoise stream cut it way through the dense and real lush forest. Small islands within the stream are covered in emerald green spore-plants and alike, vines cover the huge trees, and numerous turquoise ponds are found in-between the white rocks. The water is so clear, it look like the fish are flying. I have it all to my self, and I doubt this is where the guides leads their guests. It feel so undisturbed, and the only sound is the birds and the water. Realising I get way too many photos, I eventually turn around, but I make even more on the way back. I make it back to the costal road, and try to find a restaurant. Here are several "restaurants" in small sheets, but none have any customers. Then I see on with two taxis in front, and give it a try. I get some steamed vegetables and brown rice, but the view it the main advent: Right out to a perfect beach, under some huge trees. Close to home, I find the recommended Winifred Beach. This is where the locals enjoy the beach, and here are a few low-key sheets, selling drinks and food. It is a real nice beach, and here, I find the two German girls I had breakfast with, and the Danes from the Blue Mountains. I find a path at the end of the beach, and it follow the rocks, and then head into the dense forest. Back at the beach, I treat myself with a Malta, and head on. Next stop is the famous Blue Lagoon, known from the movie by the same name and the movie Cocktail. Apparently, it can only be reached by boat, and I find a guy with a little bamboo raft. We go around the rocks and enters the lagoon. It is a cove, dominated by a 60 meter deep hole, filled with layers of salt- and fresh water. In the inner part of the cove, a pond hold freshwater from the blue mountains. I guess one should have the movies in mind, to appreciate this fully. Personally, I haven't seen The Blue Lagoon and I can't remember Cocktail. After a hour at sea, I returns home. A bit of work, and then I head a bit up the road to buy dinner. I have to talk the chief into making me some vegetarian, and I end up with steamed vegetables and brown rice - once again. Back to work some more. This evening is almost a bit chill. North Coast, Reach Falls, Winifred Beach and the Blue Lagoo and more from Reach Falls. It is time for Diary 2 and a trip back to the Blue Mountains.